Corks popping, crystal stemware ringing, quiet conversations punctuated with bursts of laughter. This Lounge and Dining space is ready for a party with friends or intimate dinner for two. The Lounge greets you with a quirky combination of texture, pattern and color. Bleached teak and crystal cocktail tables, a faux hair hide rug, and Recamier upholstered in a Jonathan Adler flame-stitch fabric sit beneath a simple 24-light tear drop chandelier by ET2. New to the space are closets and banquette with drawers upping the storage possibilities while creating a lovely perch to read or gaze outside to old growth cedars. 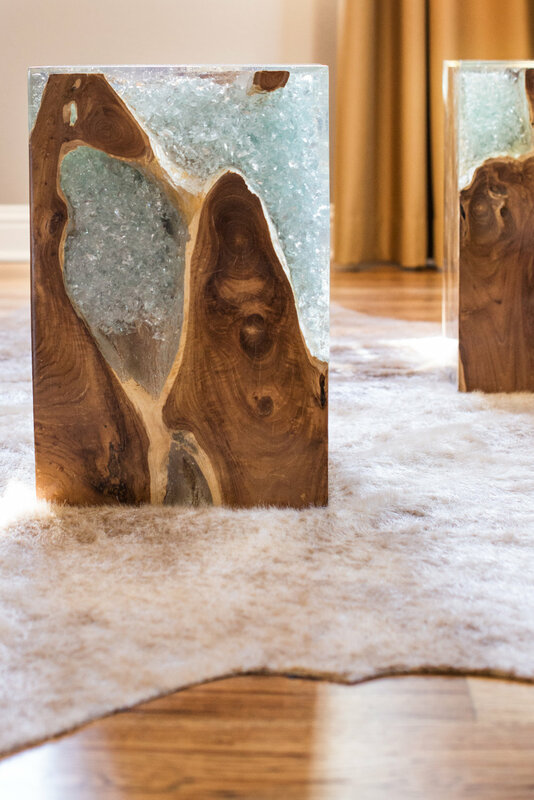 Continuing the texture and pattern in the Dining area begins with a one-of-a-kind, nine foot table from Urban Hardwoods. 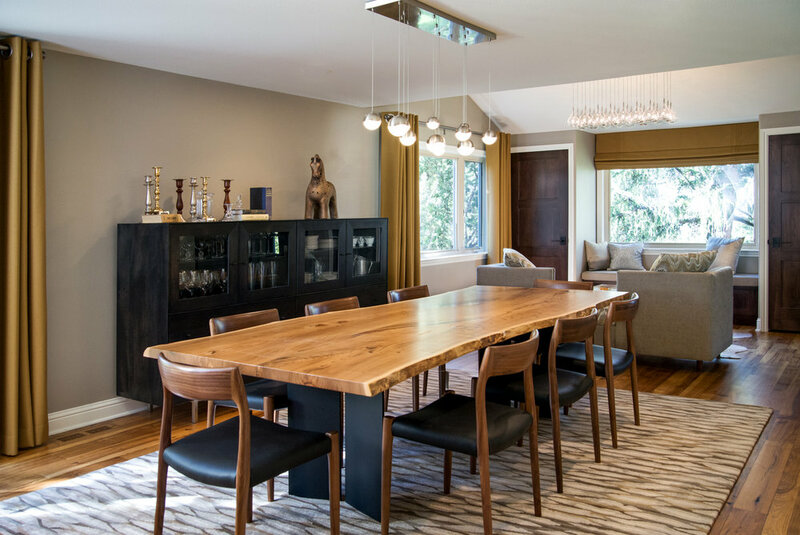 Given new life, the salvaged English elm sits atop a split chevron base, its live edge contrasting nicely with the smooth fluid form of walnut Moller Model 77 side chairs. A hand knotted wool and silk area rug continues the organic pattern play underfoot. Original artwork by Ewoud de Groot, silver bark mirror frame, wool drapes the color of soft caramel, and orbs floating in suspended animation offer intriguing views from any seat at the table. Cheers!